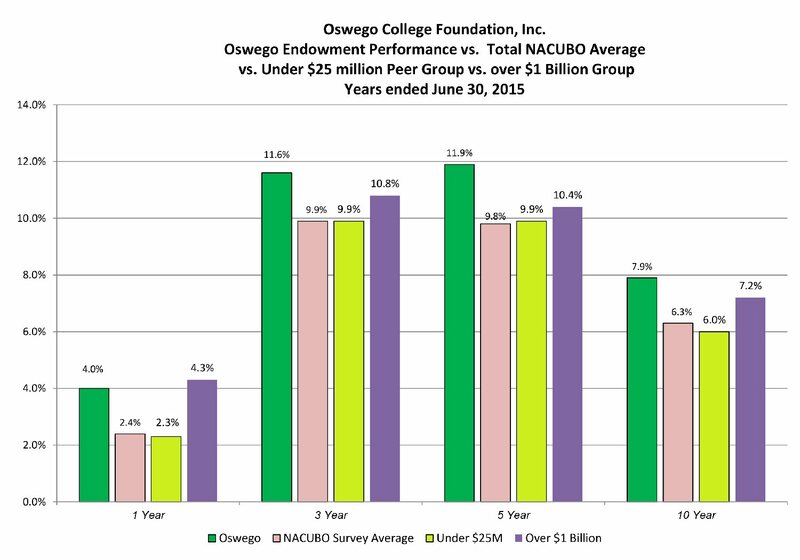 OSWEGO — The SUNY Oswego College Foundation’s endowment recorded a rate of return that was nearly double that of its peers, according to the 2015 NACUBO-Commonfund Study of Endowments released in January. Oswego’s 4 percent rate of return in 2015 outpaced peers — colleges with endowments under $25 million — that had an average rate of 2.3 percent, and outperformed the overall industry average of 2.4 percent, according to the report. Even more impressive is the college’s 10-year rate of return of 7.9 percent, which exceeded the 7.2 percent rate of Oswego’s aspirational group — universities with endowments over $1 billion — and the industry average of 6.3 percent. This long-term rate of return is a key factor determining how much money the Oswego College Foundation will pay out for its more than 300 privately endowed scholarships. The National Association of College and University Business Officers (NACUBO) report is based on data gathered from 812 U.S. colleges and universities from July 1, 2014, to June 30, 2015. Building the endowment has been a priority for the college in recent years. It has grown from $4 million in 2004 to $22 million by June 30, 2015, and stood at $28.2 million on Dec. 31, 2015. “The Investment Committee keeps a watchful eye on the markets and has worked to establish a strategy supporting President Stanley’s long-term vision for improving student access and success,” said Steve Doran, chair of the foundation’s investment committee and a 1982 Oswego graduate. The college is in its final months of a five-year, $40 million campaign, titled “With Passion & Purpose,” which seeks to increase the endowment to invigorate the intellectual climate on campus and increase support for student access and success programs. The college has raised more than $38 million in the campaign, which will end June 30. The current fundraising campaign has brought in several major gifts to the college, including a $7.5 million gift from the estate of Oswego County residents Lorraine and Nunzio Marano and a $5 million gift from Barbara Palmer Shineman, an emeritus professor and Oswego graduate of 1965 (master’s 1971), and the Richard S. Shineman Foundation.